No one can resists the goodness a pancake offers and that is the truth. Now, speaking of pancake, there is this one special pancake that Russians really love. In fact, it is a part of every Russian’s life. Russians call this pancake ‘Blini’. Blini in Russian culture holds a very special place. It is a part of Russian’s life and even death. Things are about to get interesting because today we are bringing you the history and fun facts about blini. Yes, blini is indeed very very old. In fact, it has just celebrated its 1000th birthday not so long ago. You must be wondering who have the brilliant idea of creating such a delicacy. Little did we all know, blini started out as a mistake. It was told that, one day in the depth of the Middle Ages, a starving traveler paused his journey and heated some oat jelly. One thing or another distracted the traveler and for a short while, he forgot about the oat jelly he was heating. He left the oat jelly mixture to fry over the heat. Then, voila! The first blini was born. It marked the journey of Blini in Russian culture. 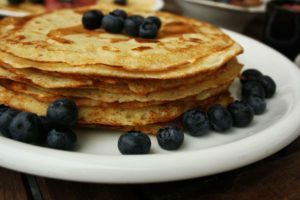 Today, blini is not only made of oats, but also barley, rye, and buckwheat. In case you are wondering, the “butter week” refers to Maslenitsa, the week-long celebration of the end of winter and the welcoming festival of spring in Russia. Besides for the bizarre traditions, people also identify Maslenitsa with blini, as Russians serve plenty of blini during the week. Long story short, the round-shaped blini in Russian culture symbolizes the sun during Maslenitsa celebration. Of course it seems fitting as Maslenitsa is also the celebration of welcoming the warm sunny days back and bidding adieu to the dark and cold winter time. During the week of celebration, women would prepare batches of Blini. By doing these, Russian believe they are preparing for a season of harvest that is fruitful. All throughout the week of festive celebration, Russian would eat nothing but the round, thin pancakes. These days, people get creative with how they serve Blini. Some would serve the pancake with caviar on top or those with sweet tooth would put cream and fruit on their pancakes. Yes, blini indeed has a very special place in every Russian’s life. In fact, it plays an integral part of the culture. Blini follow Russians’ journey from their birth to death. In terms of birth, people would give woman who has just given birth blini because they believe it would bring good luck for the baby. On the other hand, when someone passed away, the family would serve blini in buckets. They believe that serving blini a funeral service symbolizes good will, as well as happiness. It might be safe to say that Blini is indeed a very elite food. Not only it is tasty with all that buttery goodness, it is also highly diverse (thanks to the creative Russians behind numerous Blini based delicacies). What you might not know is Blini in Russian culture is very highly regarded. People actually write about Blini and not only in cookbooks. Renowned Russian writers like Gogol, Pushkin, and Chekov dedicated pages of their masterpieces and even stories to Blini. What is more interesting is that Blini is also frequently mentioned in Russian proverbs, poems, as well as songs. Back then, the process of preparing Blini was more complicated and mysterious than it is now. Women of respective households would firstly make sponge dough from lukewarm water, flour, and of course yeast. They would go to places of high significance like the edge of the forest or lakeshore to prepare the dough. Then, when they got home, they would start the griddle to cook the Blini. The interesting part is, each household would put the first pancakes on the windowsills and give them out to the poor so that they could also enjoy the warm delicacies before indulging themselves in some joy of Maslenitsa. Pan or griddle people use to make Blini are not just any pan. It is made of cast-iron and does not have any handle. The interesting thing is, we can only use the pan to make Blini since we can not prepare any other food on it. When cooked on such a pan, Blini would not burn. We can even jolt the pancakes so high in the air while flipping them from one side to another. Fun fact: in ancient Russia, there were even races where people would race and run while flipping Blini. A very fun part of Russian tradition indeed! Until next time, eager learners!